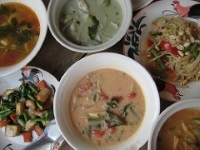 Thai-cooking is an art the local people are more than happy to share, with cookery schools and classes springing up countrywide; Bangkok, Phuket, Koh Samui and Chiang Mai are the leading destinations for this appetising endeavour. Many resorts and hotels offer these courses for guests. The lessons are relatively cheap and feature unique highlights, from watching professional hotel chefs at work, to a more hands-on approach with local market shopping trips and a free recipe book. Course schedules vary from introductory classes aimed at providing a basic knowledge of Thai food to 10 days of intense and advanced culinary instruction. Most of the schools or instructors have websites providing course and contact details, and internet bookings are possible. This is a wonderful activity that will stay with travellers long after their tans have faded, ensuring a vacation reminder and skill for life.